When you live in a state with a crazy high cost of living, you learn quickly how to cut corners in order to make the budget work. Eating out becomes a rare pleasure. You stop shopping just for fun and stick to the ‘need’ list. You learn to turn out lights and shut off the air. You cut where you can, but the grocery bill is a tough one. In the absence of an Aldi (oh, sweet Aldi, how you are missed), one becomes a Costco aficionado. In a place like Hawaii, this store becomes a girl’s best friend. Costco, with their wide range of high quality items at budget conscious prices, is a godsend. There are name brand items and no-nonsense “Kirkland” options to give us choices. I’ll admit, the prospect of saving a few bucks usually has me reaching for the store brand. I’d much prefer to squirrel away my pennies for a family vacation than to spend it on a fancy package with a marketing budget. It’s no secret that I’m an agriculture lover, and I honestly like all kinds of farming. On our fruit farm I grew using mostly organic practices (though not certified), and was surrounded by my in-laws growing mostly genetically modified crops. There was no conflict there, just respect for the various methods people use to grow food. I have no problem with organic growers – they’re choosing what they feel is best and filling a niche market. The current numbers available from the USDA (look for the new report this year) tell us that certified organic makes up roughly 0.7% of US cropland. This is not a huge sector of our economy, but there is a segment of the population that can afford to purchase these luxury items. More power to them. What I have completely lost patience with over the past few years is the marketing for the organic industry. The farmers are hardly complicit in the deception as it appears to be funded by large organic producers that stand to command high profits by spreading the false idea that organic produce is safer, more nutritious, and better for the environment. 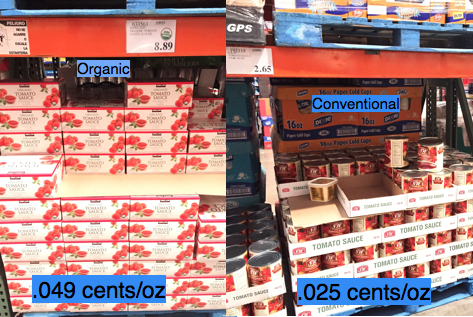 As for Costco, they seemed to stay above the rhetoric on organic for some time. I hoped it was because they understood it was a marketing ploy, and I appreciated that they focused on quality and price over the latest trends. This past year, I have seen a marked change in my favorite store on Maui. Organic products have appeared with growing frequency. At first, I didn’t mind. If people want to pay more for the same product, fine. That’s their choice. Yet just this month, I’ve found it increasingly difficult to find a non-organic option for some of my regular purchases. For example, I went to grab a bag of Ruffles Potato Chips which normally run around $6.29 on Maui, and the only option available was Organic Ruffles for a good $2 more! I checked out, sans chips, and cruised over to Foodland for my snacking needs. Our Christmas dinner called for frozen sweet corn, and the only option available was organic. I couldn’t even compare the price since there was no alternative. Amid all the bustle of pre-Holiday shopping I grudgingly added it to my cart since a trip to another store was not overly appealing, but it hurt. I felt I was supporting a fear based marketing campaign. Today, the January 2015 edition of The Costco Connection arrived in my mailbox. This is a publication in which I always find at least one interesting article. 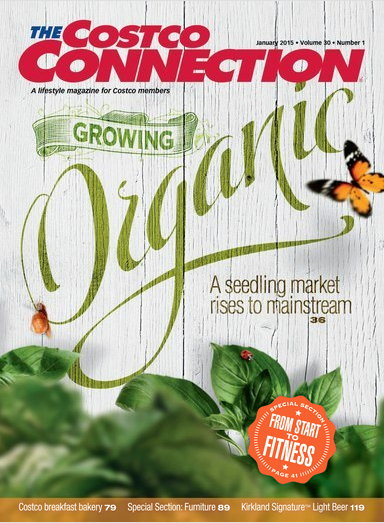 The cover, with “Growing Organic” splashed across the front had me curious. 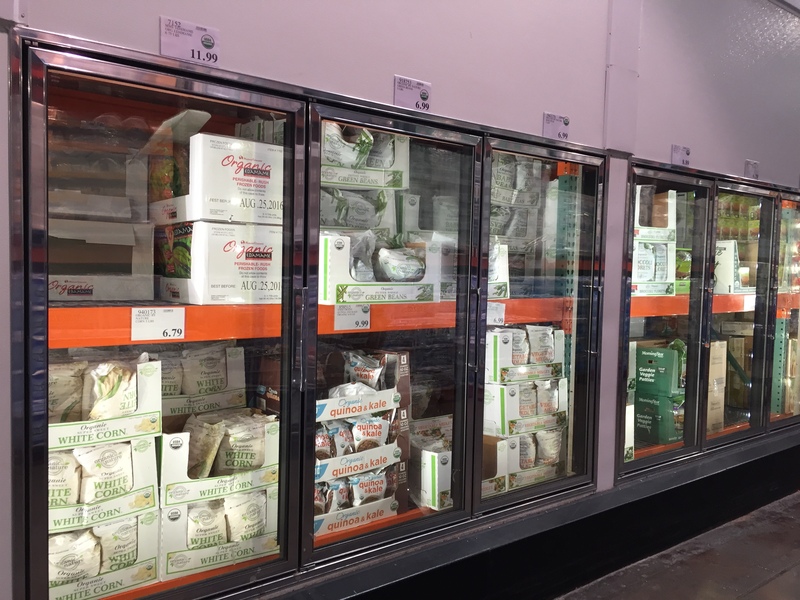 What is Costco’s take on organic products? The last sentence of this intro was what really had me jumping out of my seat. It reads, “At the end of the day, you are the one who decides what goes in your cart.” Hold the phone. How many times recently had I passed over a purchase at Costco because the only option was organic? Yes, I decide what goes in my cart, but if the only option I have as a member of your store is organic, how do I really have a choice if I wish to live according to my standards? A standard that says: I will not further a fear-based marketing agenda by purchasing mass produced organic products at a higher price. I know that two weeks ago I bypassed an apple purchase at Costco because all eight options in the produce aisle were Certified Organic. I have not purchased blueberries there in over a year because the only frozen option is not one that aligns with my standards. Being committed to evidence-based annoyance, I felt it only fair to actually see if my earlier perceptions about a lack of options at Costco were, in fact, true. I dropped the magazine, hopped in the car, and took a trip to my local store. The first stop was the frozen produce section. I couldn’t find a single frozen vegetable that wasn’t organic. Corn, Peas, Beans, Broccoli, Vegetable Medly, and Kale – every one, no other option. Fresh carrots were no different. I could get organic carrots and organic baby carrots, but no conventional carrots. It’s easy to see that conventional products are significantly less expensive than organic. Therefore, when Costco doesn’t offer a conventionally grown item, I’m forced to pay more for fear, or drive to another store. I purchased my membership at a time when there were basically zero organic products in this store. Obviously, this is no longer the case. Yes, I can go over to Times, Safeway, or Foodland, but I pay for that Costco Membership for a reason. I want great deals on quality products, but I don’t want to pay into a fear-based marketing system. 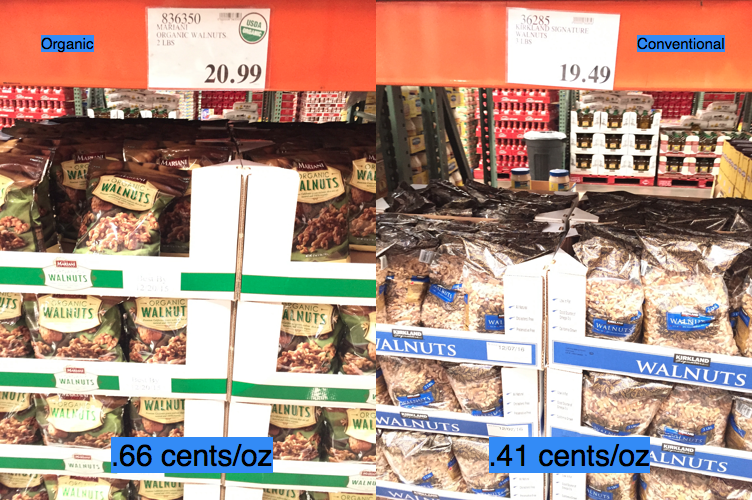 So yes, Costco, at the end of the day, I am the one that chooses what goes in my cart. Costco is still my favorite store on island, but my cart will be rolling through an establishment across town when it comes to the products for which you give me only an organic choice. Tags: Costco, Costco Connection. Bookmark the permalink. Previous post ← I Will Not Slop Hogs EVER! Yessss, what’s up with that Costco? I have been a member for many years but am becoming unsatisfied. I still save so much money there, and love the store, but it is frustrating to see them trending in this way. Time will tell. I feel the same way! I too had to go to Safeway to buy apples for my Thanksgiving pie to avoid Costco’s only organic offerings. I haven’t bought canned black beans or mushrooms in months! I keep requesting a conventional option with their comment box to no avail. Choice is fine with me too–but when there isn’t a choice, I will also leave the organic stuff and shop elsewhere. Same for the non-GMO label too. There have been things I used to get at Costco but now I won’t for precisely this reason. I too agree with what you are seeing at Costco. I’ve reduced my spending there tremendously as a result. I also don’t care for the quality of some of the organic products either for what you pay for. It’s not a place of value anymore but a place to satisfy someone’s need for overpriced food snobbery. I went to Costco today. There are rows and rows of vitamin pills supplements and all the rest of the Organic “Pharmacopoeia”. I have been a critic and a boy-cotter of Organic stores because of this very thing for years. We called “Whole Foods,” “Whole Paycheck Foods” when we lived in California. We’ll have to adapt that name to Costco now. We are Aldi shoppers! Great store. I like the thread here. It is good to see the consumer voicing their opinion with their pocket book. May the marketplace continue to give us the choices we want. Aldi, it’s like Christmas when I walk into a store after being in Hawaii so long. I just want to buy one of everything just because the price is so ridiculously low. I’m trying to stick with my committment to not buy a single organic product at Costco, and it’s mostly involved just a little extra driving to the next store, but I have one child upset- there is no non-organic version of Acai Juice anywhere. She loves that stuff, and I can’t decide if it’s cheating when a conventional version doesn’t exist! First world problems. Since I read this article I have been overly aware of this push. I first noticed my grocery bill had increased dramatically for no apparent reason. After I read this it all made sense. 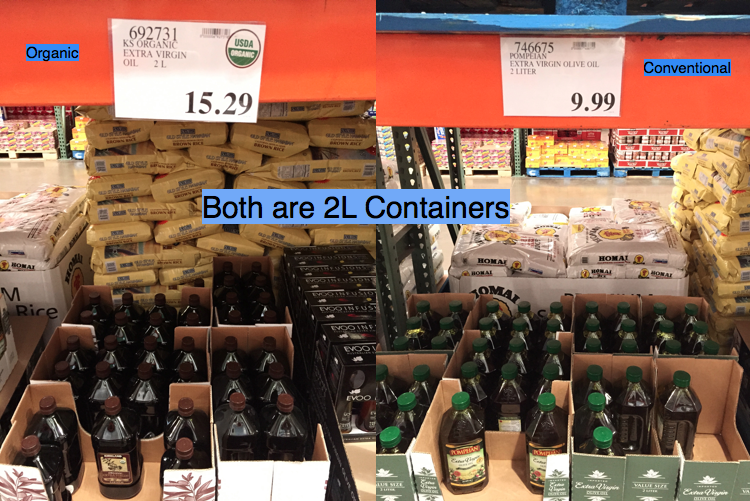 Costco is by far on of the worst at pushing the organic stuff, but everywhere on the mainland it is happening. Shopping is hard for me often, so if I am at Costco-I do buy at Costco. However, it should be my choice whether I want to pay a couple extra dollars for something organic. Consumer beware! Now at Safeway and Holiday, I am really aware of which is which.